Instead of splurging on manufactured still less sturdy styles of furniture, built your own lasting ones at home! Today we will focus on that how you can build suitable furniture for any of your space, this DIY pallet media stand can amazingly be fixed at any corner of your family media room and will surely maximize your existing space. Sometime living in narrower room interior we just try to use every inch of our living space carefully and in mannered way, such a custom built, no-cost and functional pieces of pallet furniture can really rock your work in such cases! There is a slim drawer space and a sub cabinet underside the triangular and sectional top of this DIY pallet sectional TV stand and you can comfortably organize your media and other belonging in it! 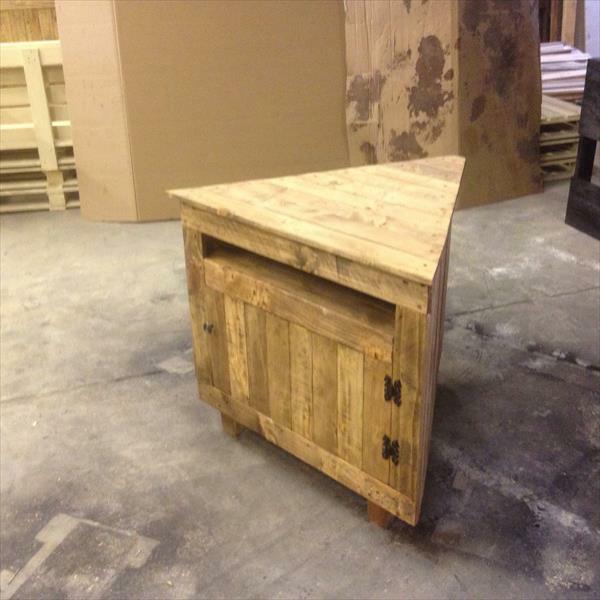 Just grab some pallets, get creative and get busy in building your direly needed furniture elements with them!